What would you think if all that frustration with dropped bobby pins and hair clips could be erased? Enter the Hairpin Pal, an amazing invention for dancers! The Hairpin Pal is a magnetic hairpin holder that is the answer you’ve been looking for to help organize all kinds of hair clips and barrettes from bobby pins to fancy accessories. The powerful magnetic field magically orients clips in a line so they are easy to pick up. 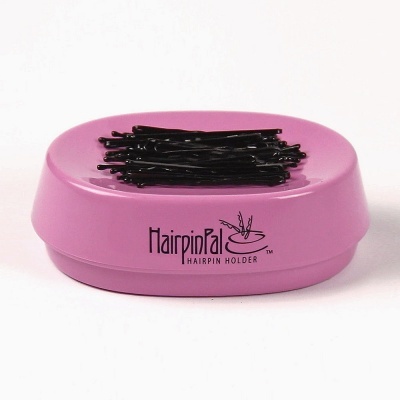 The magnet is so strong that you can toss a clip or bobby pin toward the bowl surface and Hairpin Pal will catch it! Or just sweep over loose or dropped clips and Hairpin Pal snaps them up instantly! Also includes 20 black bobby pins. See it to believe it by clicking on the Video tab for more information. The Hairpin Pal measures 3" x 4-1/4" x 1-1/4". 1. Is the Hairpin Pal also a container to store hairpins inside? No, this does not have any storage space inside. It's more of a magnetic bowl that will securely hold the pins on its top.